Silicone molding is a powerful production method that, when combined with 3D printing, can allow you to make several copies of one product. You can also create a product in a material that is not supported by your 3D printer. 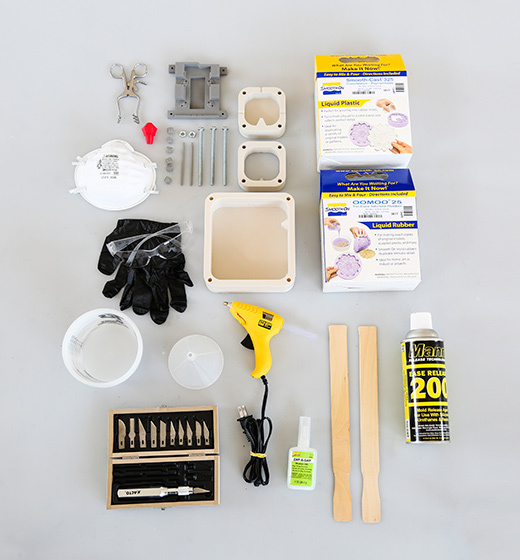 In this How To, we will show you some of the best practices associated with creating silicone molds around 3D printed parts. Working time will vary depending on a number of factors. Creating a mold around our 3D printed part took us about 1.5 hours. Casting into our mold took about 15 minutes. 3D printed mold box, hardware, vents & keys (read on for more info). Need some of these products? We've curated an Amazon wish list for you. Obtain a file that you would like to either make several of, or create in a material not supported by your printer. 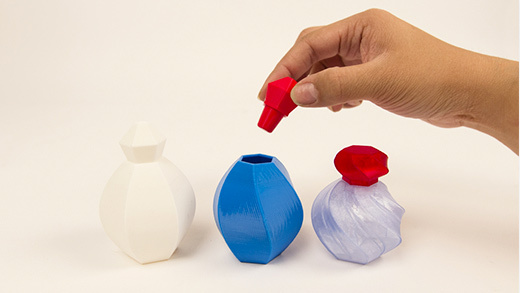 We chose the cap to a perfume bottle to understand what the process would look like for a product development team attempting to produce several concept models of a prototype. The next step is to create your mold box. This is the structure that will hold the silicone in place around your part when pouring. Your master will need to be suspended in this structure. While 3D printing your mold box isn’t necessary, it provides you with a reusable customizable mold box that the other methods cannot produce. Because the silicone molding process is not very demanding on the 3D printed mold box or master, you can select standard print settings. A: Spray your mold box, master, vents, and keys with mold release. C: With our 3D printed mold box we were able to glue our master directly onto the pour hole during preparation. You can suspend your master using popsicle sticks, skewers, or 3D printed rods glued to the surface of the master in an inconspicuous place. The holes left in their place after your mold has cured will aid in resin flow through the mold. As silicone comes in two parts, it needs to be mixed both individually and once combined with its hardener. Mix slowly using separate mixing sticks. B: Measure desired amount of silicone and hardener separately in two measuring cups. We calculated our mold volume by filling our 3D printed mold box with water and pouring the water into a measuring cup to find exact volume. For two part molds like the one shown, you only need to mix enough silicone to fill half of the volume of your mold. Once you have measured each part, combine the two parts into one mixing cup and stir slowly with a mixing tool. Be cautious not to stir in air bubbles. Be sure to scrape the sides of the cup to mix in all material. Once your parts are thoroughly mixed the curing process will begin. Read instructions on your silicone for “pot-life”. This is how long you have to work with the silicone before it cures. Pour silicone into the first half of your mold box. When pouring, pour slowly into one corner of the mold box and allow the silicone to run to other parts of the mold box as it fills. Stop when the silicone reaches the top of the first half of your mold box. Once you have poured your silicone place small keys into the silicone. These will create negative spaces and allow the mold halves to fit together once poured. We will remove them before pouring the second half of our mold. Depending on what type of silicone you are using it can take anywhere from 75 minutes to overnight to cure. Temperature and humidity will affect curing times, so we recommend this process be done in a room temperature environment. Once our mold has set, we will prepare to pour the second half of our mold. A: Remove the keys you inserted in step 9. B: Attach and secure second half of mold box. Next, repeat steps 5-9 and create the second half of your mold using the methods mentioned above. Once both halves of your mold have cured you are ready to remove them from the mold box and begin using them to recreate parts. B: Remove the mold from the mold box and open. C: Remove the master and vents. Next, you will need to reassemble your mold. A: Ensure that all parts of your mold are correctly aligned, and plug any holes created by vents. B: Secure mold pieces using rubber bands, straps, or tape. Another great application for 3D printing would be to design and print a box to hold the mold together when pouring resin, or modify the mold box we used to serve the same purpose. If your vents leave holes in areas where resin can spill out during the pour, they will need to be plugged. Supplies Used: Resin (Part A & B), measuring cups, measuring sticks, dye. Just as with silicone you will need to measure each part of the mixture taking into account the volume needed to create a part. If you have made several molds, you can mix a larger quantity of resin and pour several molds at once. Add dye to the part of the resin mixture specified in the instructions. Combine both parts of the resin mixture and mix thoroughly being sure not to stir in air bubbles. Resins typically have a shorter “pot-life” than silicone meaning they will cure faster. Once mixed, pour immediately into the opening of your mold using a funnel. Pour slowly as not to overfill and spill resin. Any resin that remains in the mixing cup will harden, but can typically be removed afterwards. Once poured, allow the resin to cure for the appropriate amount of time. Once your resin has cured, you can open the mold and remove your cast part. Any resin that escaped through seams or voids and cured is called “flash”. Flash will need to be removed from the part through post processing. Below, you can see that we were able to recreate our perfume bottle cap in several different colors and opacities using silicone molding. Visit one of our other applications pages for tips on how to take your print even further. Last but not least, remember to share your work with us on Thingiverse and social media @MakerBot.